It’s that time of year again–time to get the old car inspected. 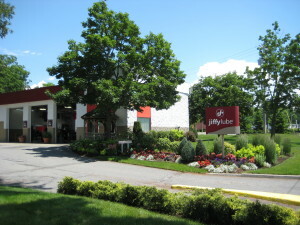 While I was nervously awaiting the verdict of the inspectors (lots of mileage on that baby) I prowled around Jiffy-Lube’s surprisingly well-tended garden, looking for something to photograph. The landscape was mowed and manicured within an inch of its life, and at first I couldn’t find a single weed. But there’s always one, if you look closely enough. Yellow wood-sorrel. In my childhood, I would taste anything—it’s a wonder I’m still alive, really—I sampled clover and grass blades and pine needles. Most of the stuff tasted pretty awful, but once in a while I discovered a real treat, like this little plant. Yellow wood sorrel is also known as lemongrass, pickle plant, and sour clover, which gives you an idea as to what it tastes like. Really more like lemon meringue than pickles, I think—there’s just a hint of sweetness. Loaded with vitamin C, of course. The plant usually grows sparsely, though, and while you could make tea or salad, it’s hard to find enough to really make a dish of it. There’s just enough for a kid to nibble on and get a little lemon-drop flavor. Unlike most parking lot weeds, it’s a native American plant. Oxalis stricta. 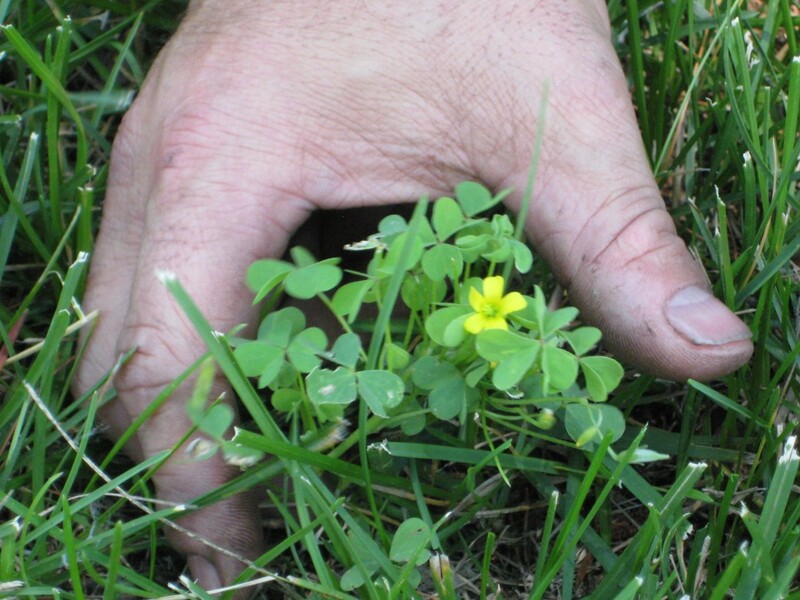 In spite of the three leaflets, it isn’t related to clovers at all, but is one of many types of wood sorrel. In the velvet lawn, the wood sorrel was about the only non-grass plant that dared to raise its head. I got out my camera and snapped away until the mechanic came out to see why this crazy person was taking pictures of the ground. But it turned out he’s a flower-lover, and responsible for that tidy garden. Together we admired the beauty of the tiny yellow blossom in the grass. Fortunately both the flower and the car passed inspection. I use to eat this grass when I was little! I just remember now & wanted to check if anyone else did too.. Yes, it tastes deliciously sour–I often nibble it. Just avoid it in parking lots where car exhaust spews over it.